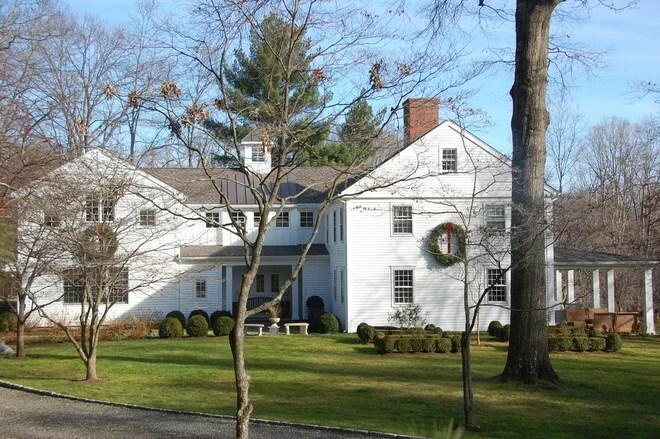 Dreading the post holiday chores? Then grab some boxes, a few supplies and this easy guide! Cleanup? I finally got my feet up! 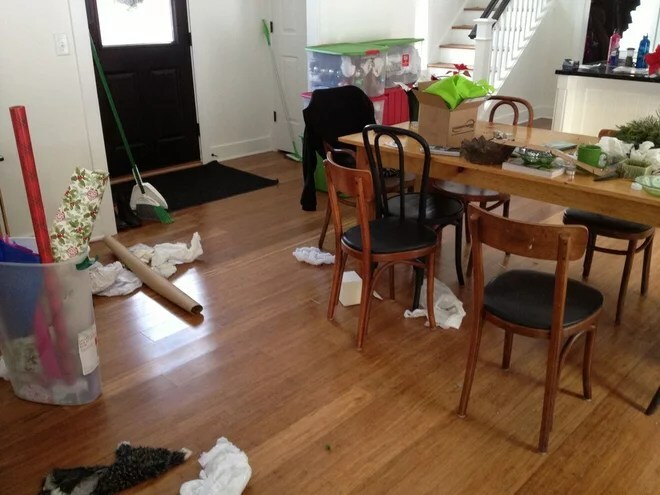 Let’s face it: After all the time and work we’ve put in to making the holidays, the last thing anyone wants to do is clean it all up. If that resonated with you, you are probably Not Naturally Organized and this is just the holiday version of the core issue that divides the Naturally and Not Naturally Organized: now or later. While we, the Not Naturally Organized, want to finally relax and maybe think about cleaning up someday, our Naturally Organized brothers and sisters are twitch, twitch, twitching to haul it all away today.But what about savoring the beauty? I’m with you completely … until February when your tree is moldering in the corner of your living room. Who wants that? Go ahead and relax; whenever you decide to tackle the mess, here are a few tips to make the process as easy as can be. 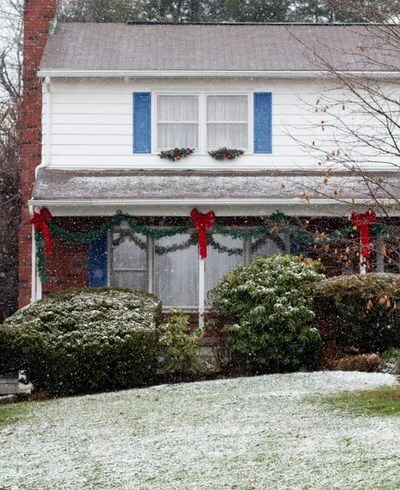 Before you tear everything apart, take some quick pictures of all of your decorations. I did this last year, and these were my reference when I pulled out the boxes this year. I made a few small changes, but this gave me an easy start. Be sure to take close-ups to see the details. This is my biggest time saver and how I start on the tree. 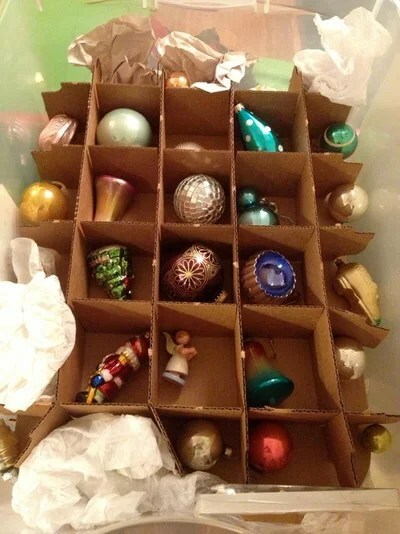 I remove the non-breakable ornaments and lay them in their box. I don’t bother removing the hooks, and with a few exceptions they don’t get tangled. I began doing this to save space on the divided boxes but found it saved me so much time. Bonus! 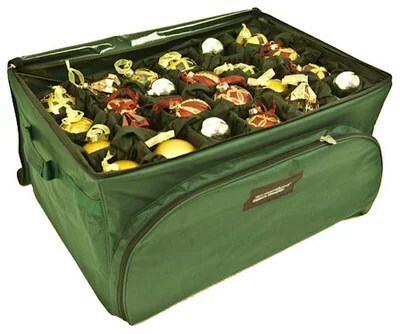 In addition to non-breakable and fragile ornaments, I have boxes for trees, books, lights and miscellaneous larger items like snow globes and the Advent calendar. With the trees I set the large ones on the bottom and carefully stack the others. The glass or pottery trees I wrap in tissue and securely place in the middle. This is a very nice box, but inexpensive plastic ones work just fine. In my family growing up, taking down the tree was as much a part of the tradition as setting it up. My siblings and I were responsible for packing up our personal ornaments, and I carefully wrapped each one in tissue. 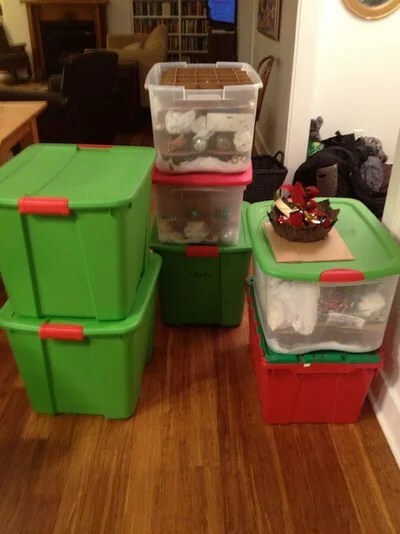 When I had my own tree with hundreds of ornaments, I dreaded putting them away every year until I finally bought a slew of boxes with dividers. After the non-breakable ornaments, I remove the fragile ones. If an ornament is precious to me, I’ll take time to wrap it in tissue, but most of them I set in their little cardboard cradles. I’ve never had an ornament break in storage. 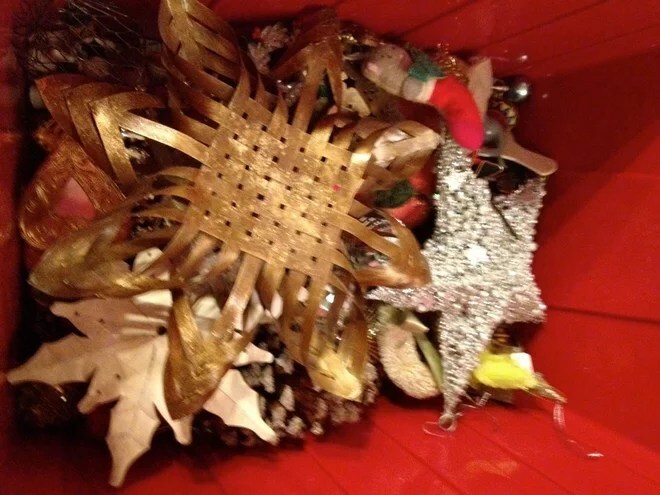 This is a really good time to cull the ornaments you don’t love or use. 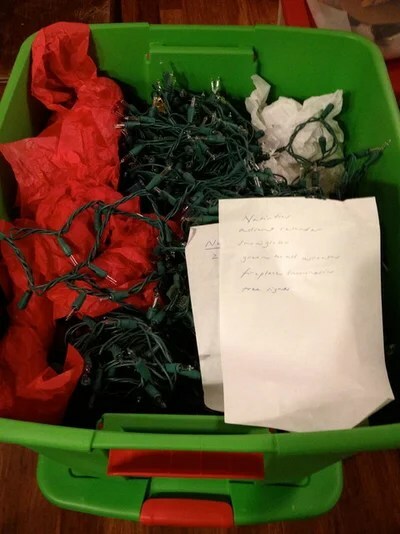 If it’s sitting in the bottom of your boxes when you take down the tree, there’s a reason. I always have a bag for Goodwill at hand. 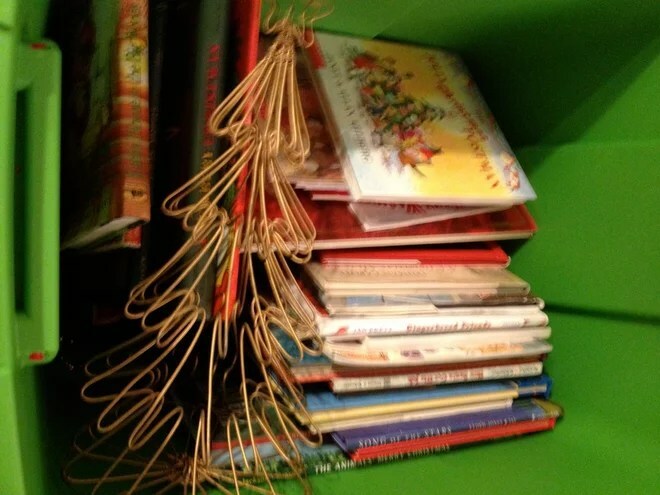 All season long I have a big basket of our Christmas books by the tree. Every night youngest and I read several titles — a favorite tradition. Storing the books is as simple as emptying the basket into their labeled box. A non-breakable tree or two is often stacked on top. This is one of my miscellaneous boxes. 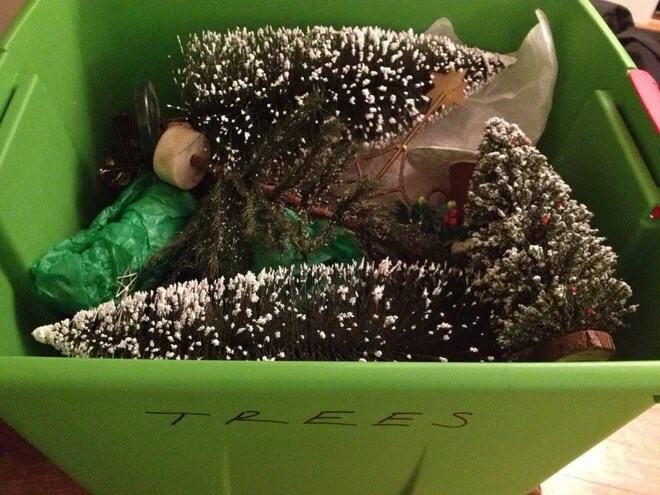 Here I’ve created an inventory for this box: nativities, Advent calendar, snow globes, wreaths, luminaries, lights for the tree. Under that is a second note and a reminder that we needed to buy two more strands of lights. I was glad to have this when we opened the boxes and before I hung the lights on our tree. What do you need or want to buy before next Christmas? Take note and write it down. I work alone stripping the tree. I’m able to move quickly without breaking anything. When all of the ornaments are boxed, I ask one or two members of my family to haul them down to storage. Although this looks like mayhem, it’s really only some cardboard, a few boxes, a bit of paper and tissue, and some greenery. This is when I want to throw in the towel, but I make myself keep going. Once I’ve recycled, thrown away or put away everything outstanding, my husband and son haul the tree out and tie it back on the van to take to a local park for recycling. I sweep and vacuum everywhere, but we’ll still see needles here and there for weeks. 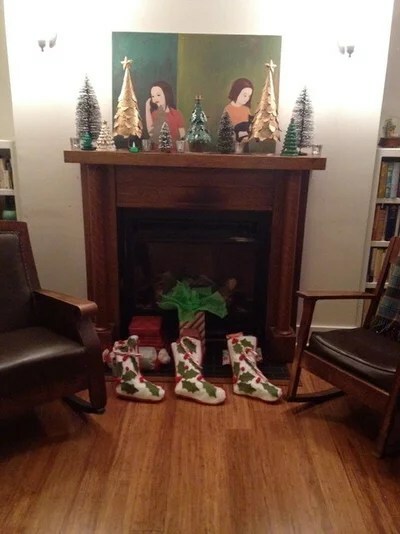 The holiday is here, and you’ve done whatever decorating you were going to do. 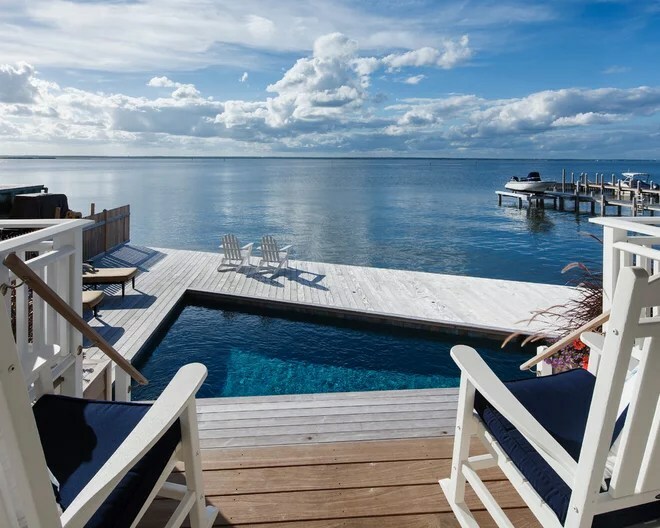 Now’s the time to sit back and enjoy the day. 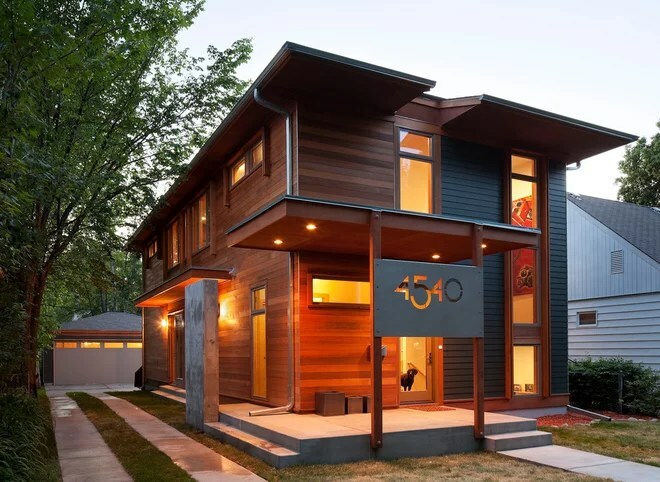 Join us in the passenger seat on a virtual holiday drive through the extended Houzz neighborhood. 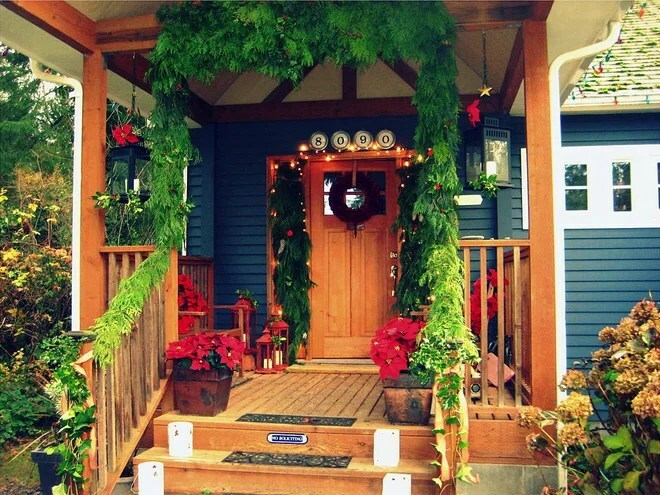 Poinsettias, backyard cedar and holly warm a cottage entry. 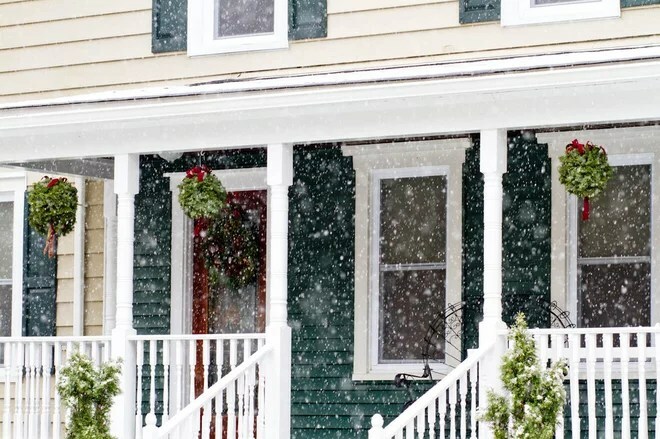 A dusting of snow turns a classic porch into a postcard. 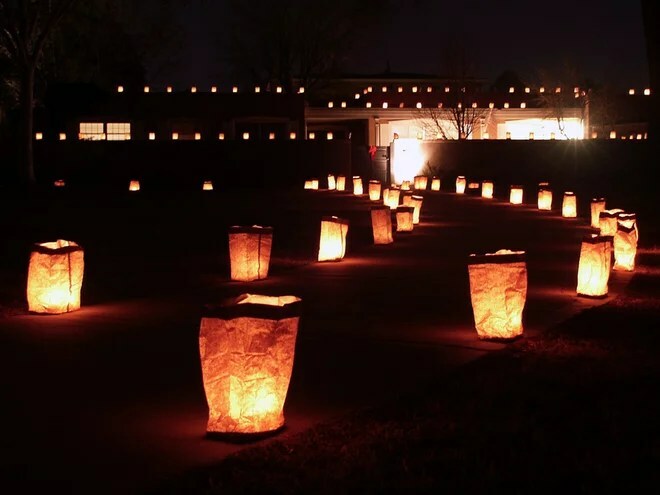 Luminarias light the way in Albuquerque, New Mexico. 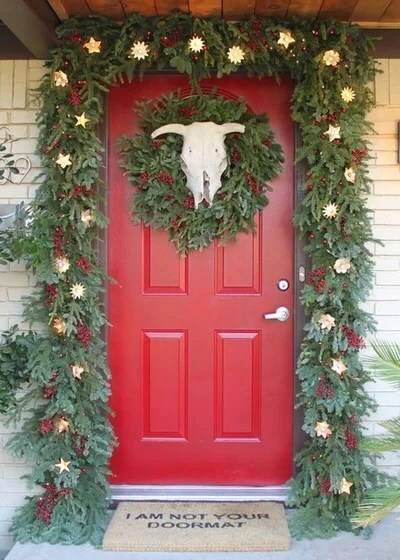 A cow skull and garlands made of free scraps from the tree lot transform a Dallas entry. 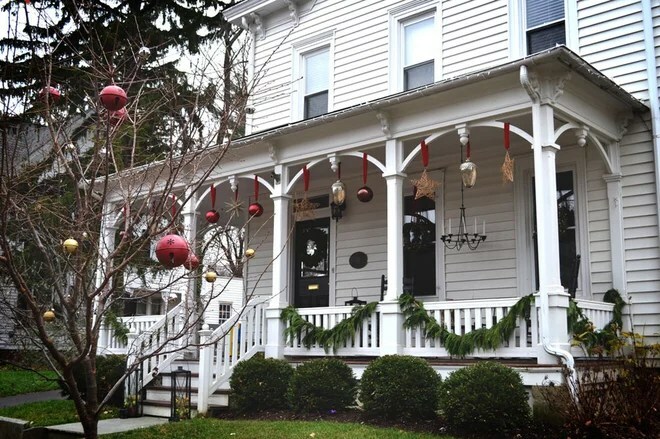 A Christmas tree on the porch says “Happy Holidays” to the neighborhood. 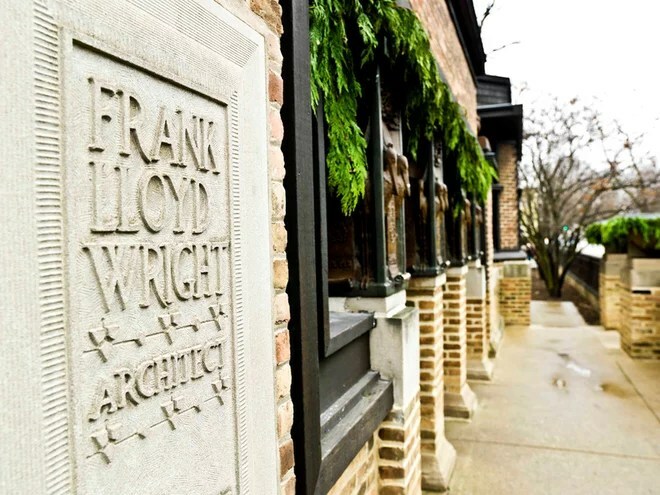 Even Frank Lloyd Wright’s house celebrates the day with handmade decorations and greenery. 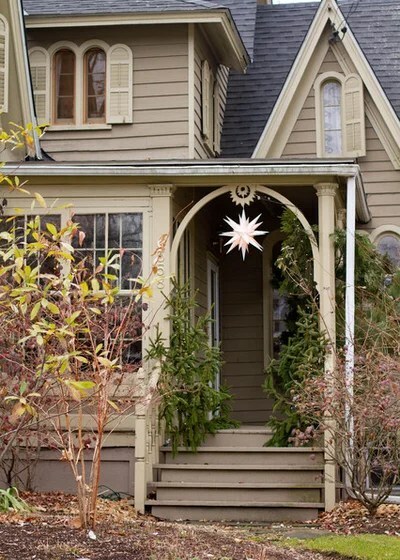 This New York porch creates its own starry night. 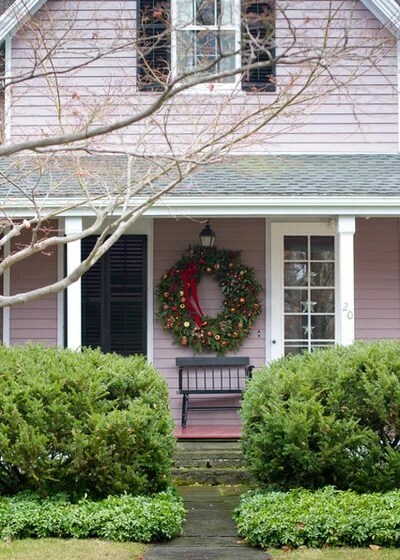 A large-scale wreath looks luxe against lilac siding. 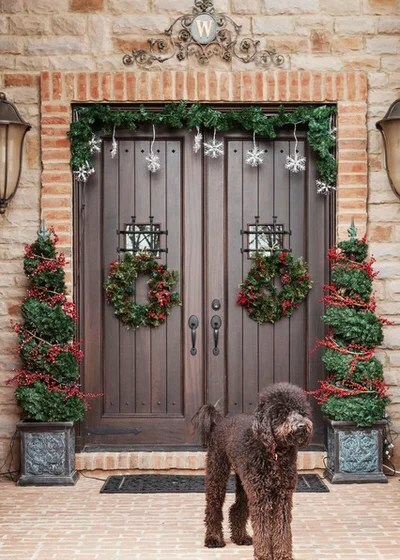 Every welcoming entry needs its greeter. 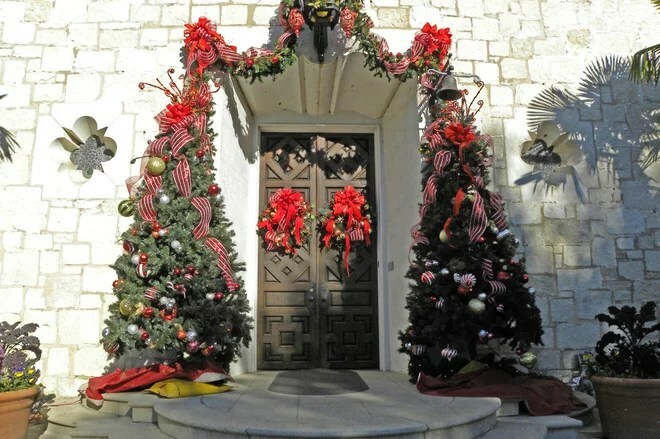 Ribbon-trimmed Christmas trees and a garland create a grand entrance to the historicDeGolyer House in Dallas. 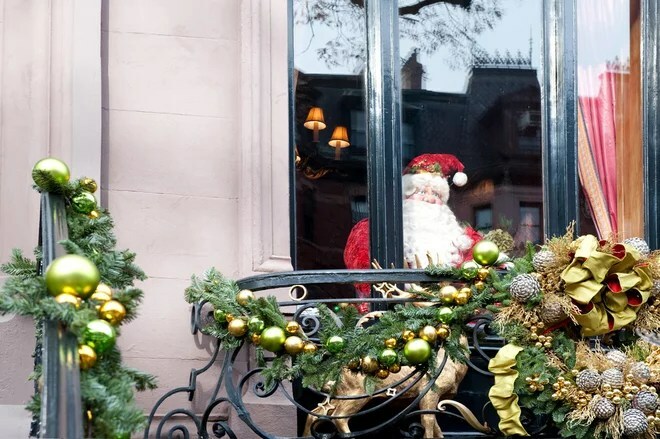 His work done for the year, Santa takes in a Boston view. Each Christmas a California family decorates their trellis gate with a wood plaque printed with words from a popular seasonal song. Crisp white: the classic background for forest greens. A pair of skis offers a graphical anchor for greens and a luxurious bow. 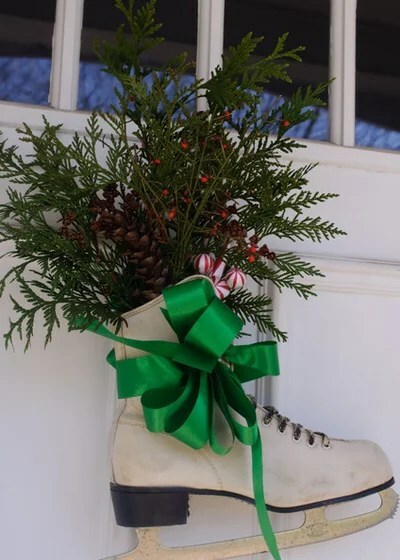 A skate filled with cuttings is one of the simplest high-impact decorations you can make. 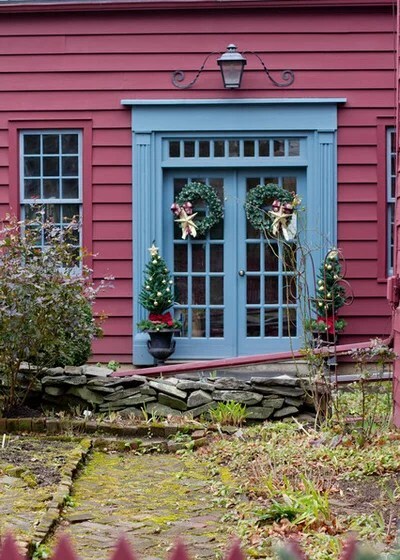 Symmetrical wreaths and topiaries suit a jewel-toned exterior in Rhinebeck, New York. 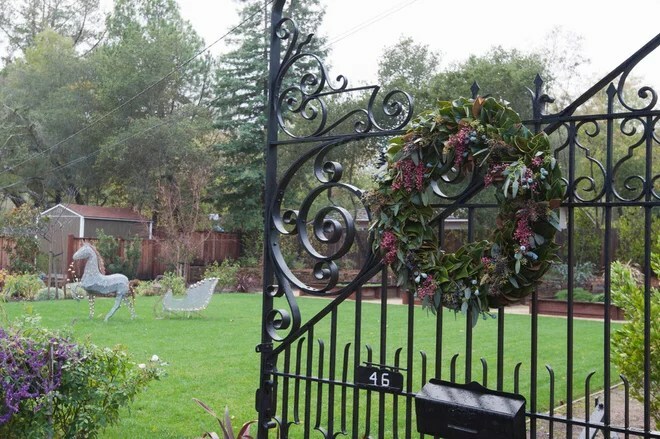 A 100-year-old iron gate adorned with a wreath designed by Marisa Lyssand opens up to a traditional-style home in Atherton, California. 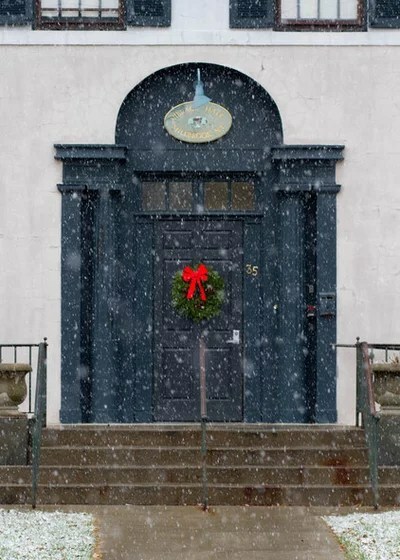 A bright bow lights the way to the Village Hall in Millbrook, New York. 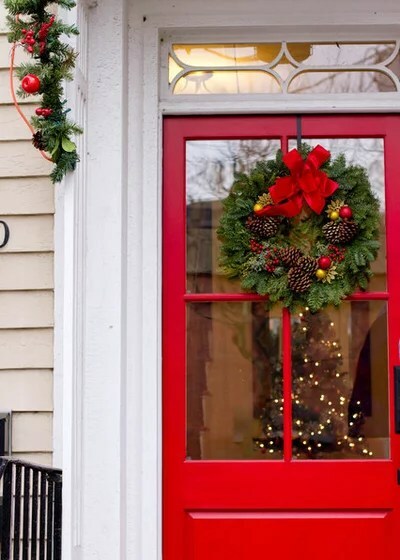 A red door definitely has its day on Christmas. 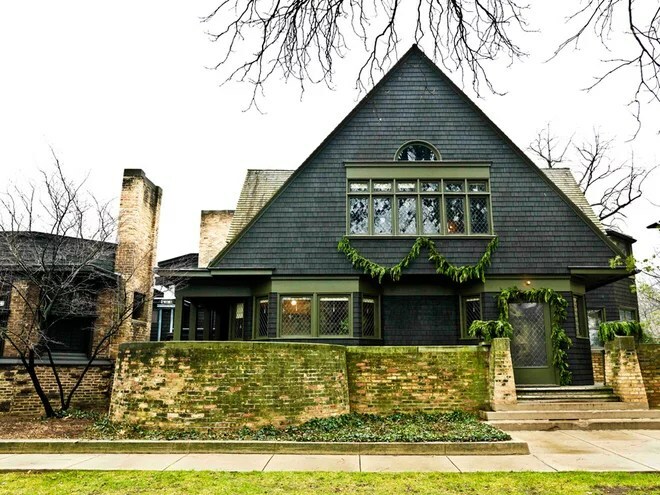 The window on this one offers a peek at an indoor tree’s twinkling lights. 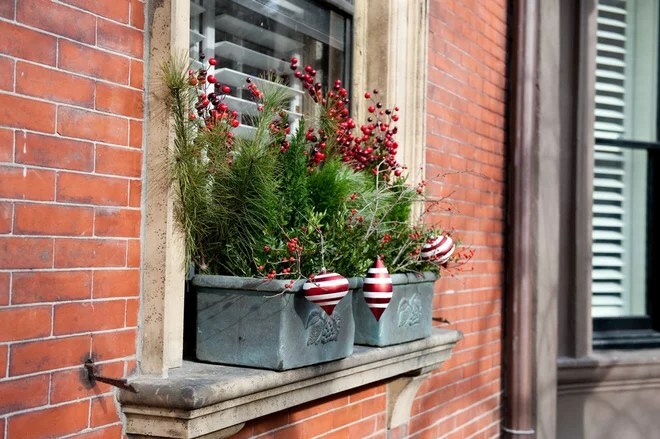 In Boston, oversize pinecones and a red ribbon fill a front window. 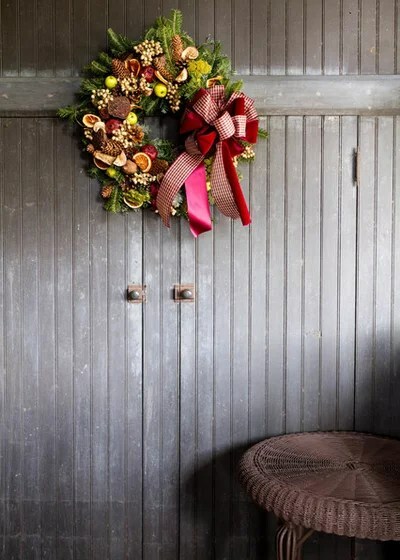 Wreaths hung at railing level combine with garlands for an elegantly simple holiday house. 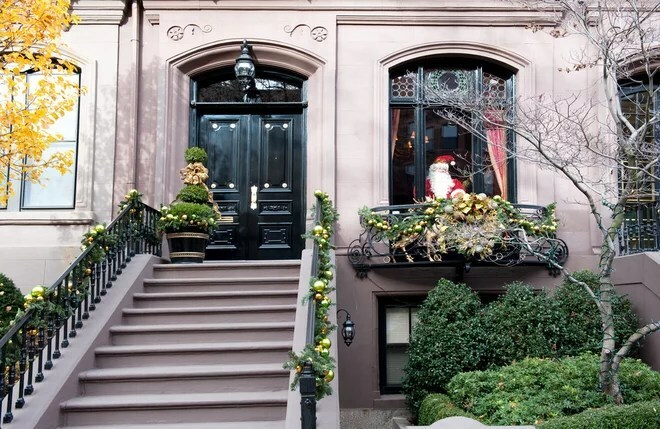 Silver baubles transform a year-round topiary in Boston. 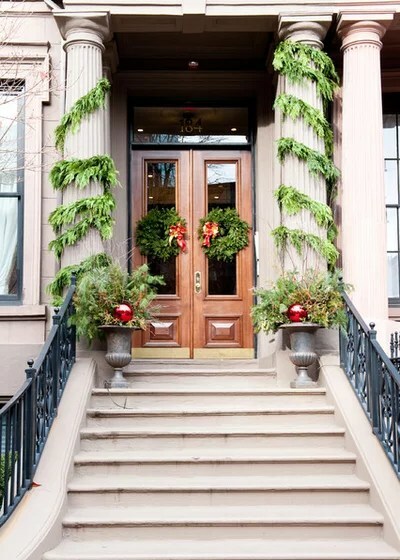 This home’s large pillars create a dramatic look wrapped in lush boughs of evergreens and oversize red ornaments. 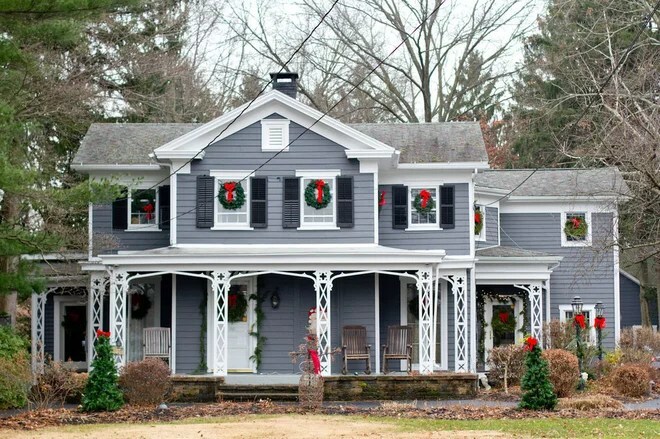 Multiple wreaths get the whole home involved. 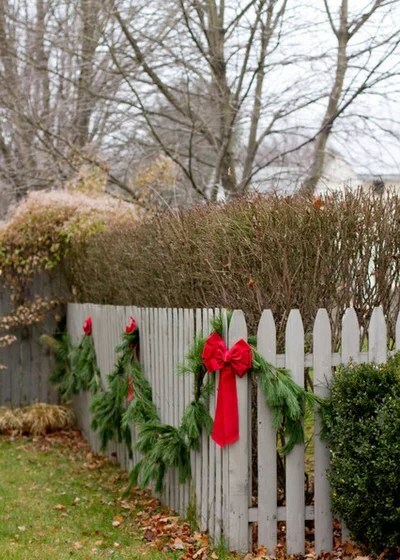 Greenery involves the whole yard in the festivities. 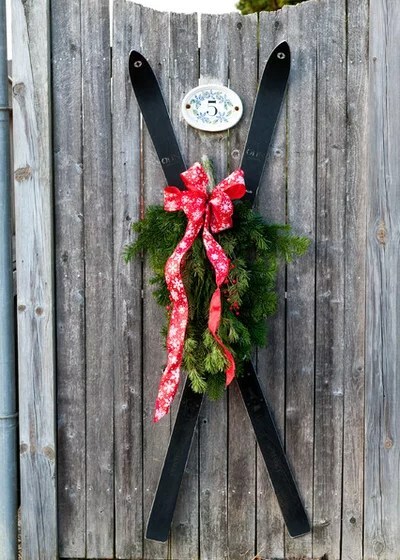 Faux garlands and loads of shine turn black doors into a party. 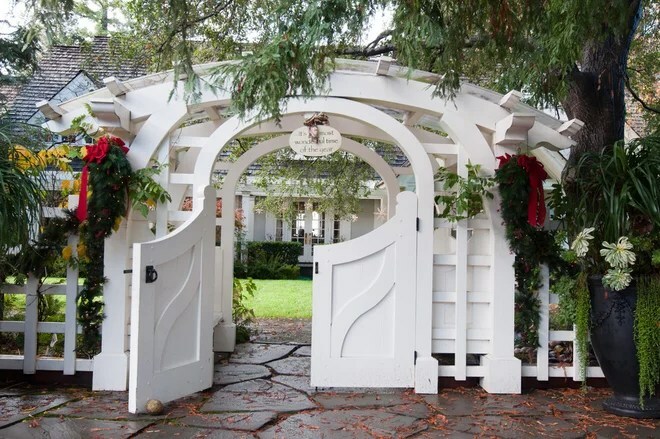 Snowy white architectural details frame an entry decorated with greens, pods and berries. 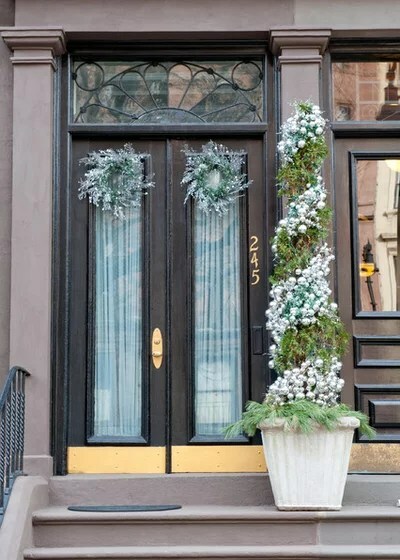 Oversize real wreaths make an impact in New York. 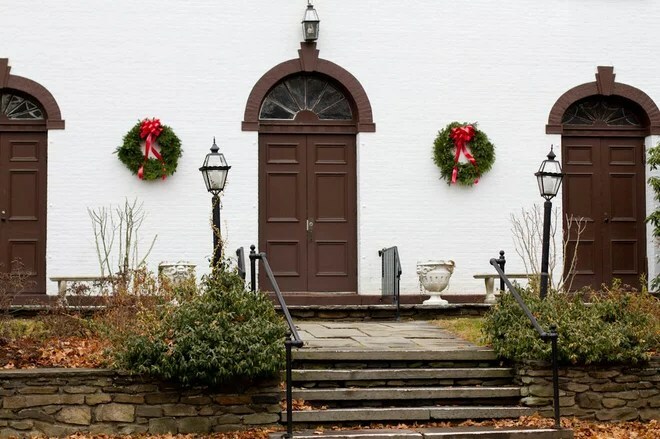 The perfect pairing of wreath and urn puts a festive flourish on a traditional holiday entry. 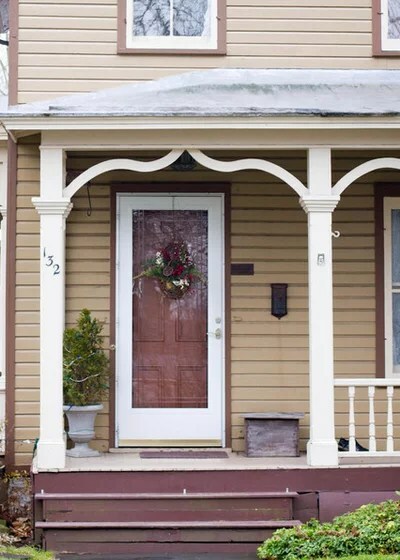 Apple green and blue bring updated color to a traditional porch. 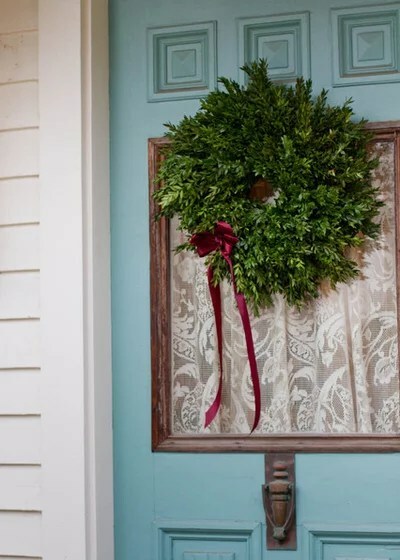 Lush greens and a simple bow are all that’s needed against a door that already has turquoise and lace going for it. 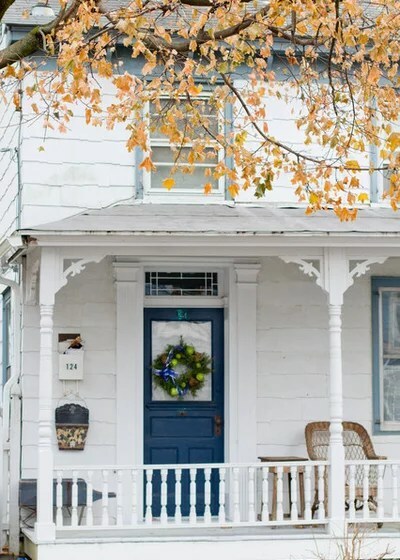 Jingle bells on bare trees and oversize ornaments on the porch create a joyful scene at this rehabbed 1870s Victorian in Philadelphia. 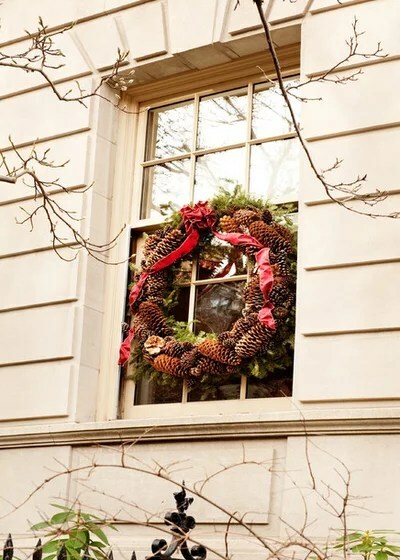 A wreath and jingle bells wink from a New York porch. 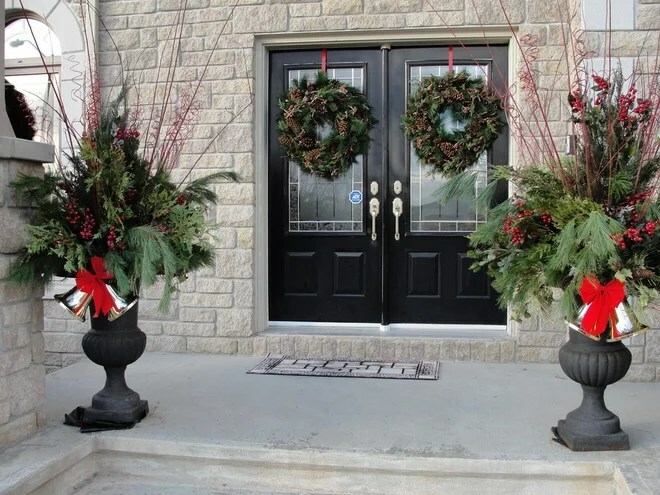 Bells, berries and branches deck an entry in Ottawa, Ontario. 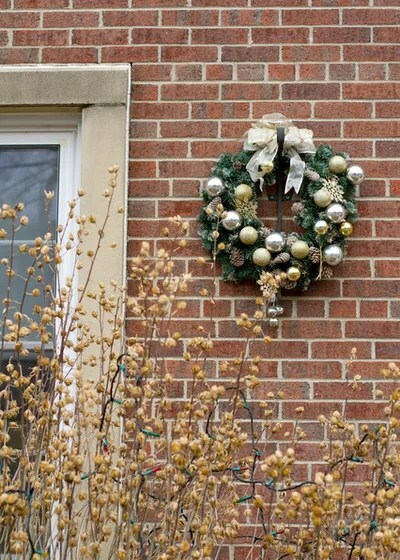 Silver ornaments on a wreath of greens add sparkle to a classic brick exterior. 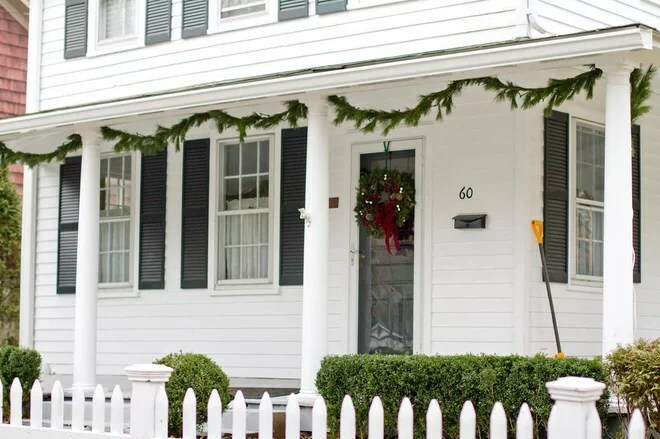 A basket on a traditional picket fence provides a pretty resting place for an armful of pinecones. 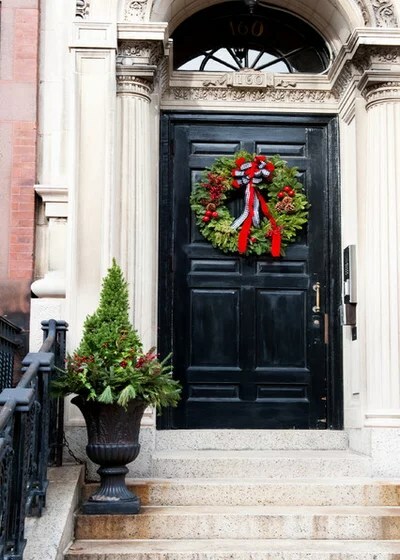 Two wreaths punctuate a series of doorways. 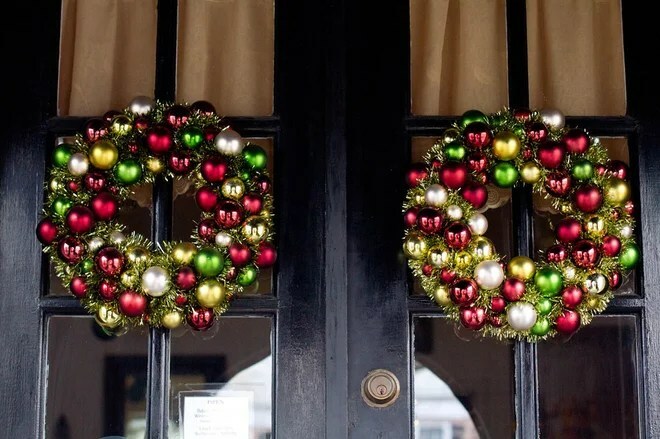 A wreath and eyebrow garland frame an offset peekaboo window. 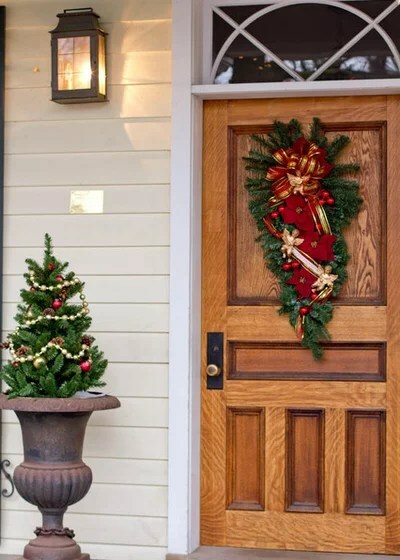 The classic shapes of tree and swag strike a perfect balance in this entryway vignette. 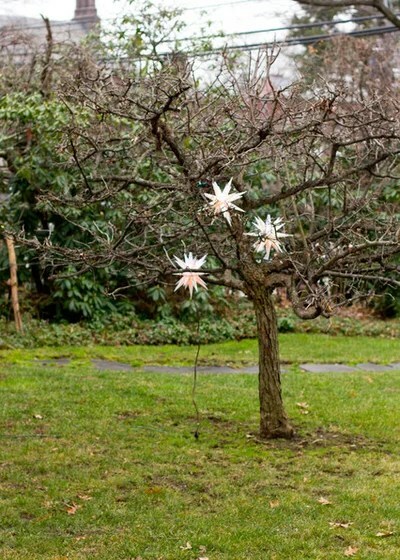 A bare fruit tree in New York dresses up for the holidays. 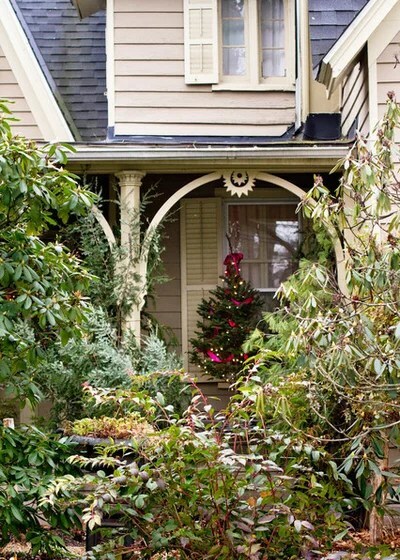 Garlands and window box–style greens drape a home in cozy. 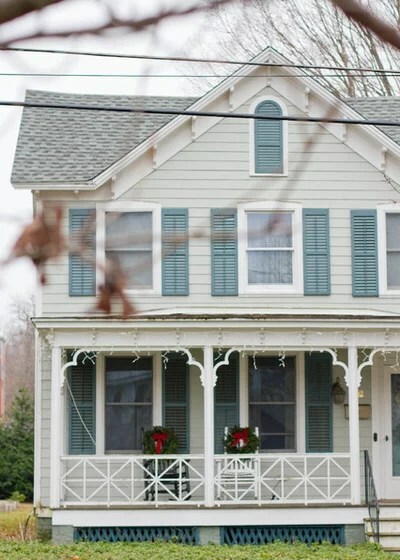 On this traditional porch, wreaths keep the rocking chairs company until it’s time to watch the leaves come back. 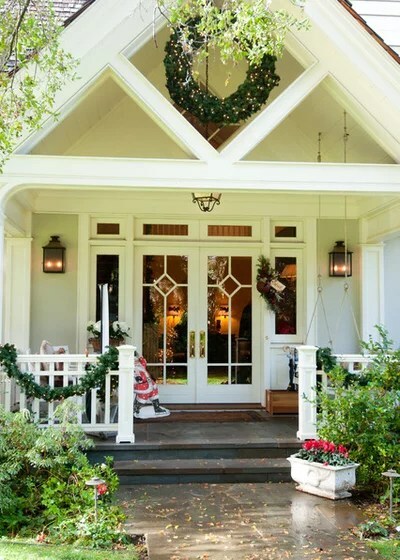 Classic Christmas style inspired the designer who dressed up this California house for a holiday home tour. 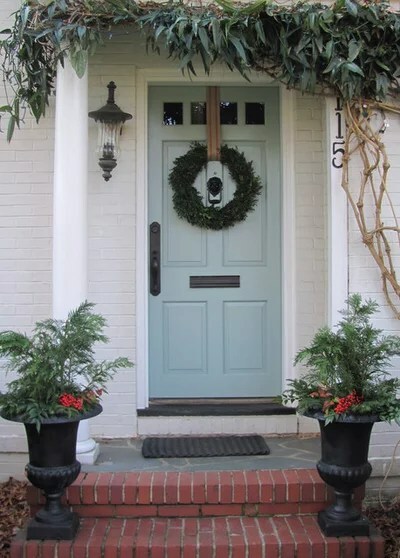 A clematis vine adds its natural greenery to a 1930s Stratton Blue–painted door in Greensboro, North Carolina. 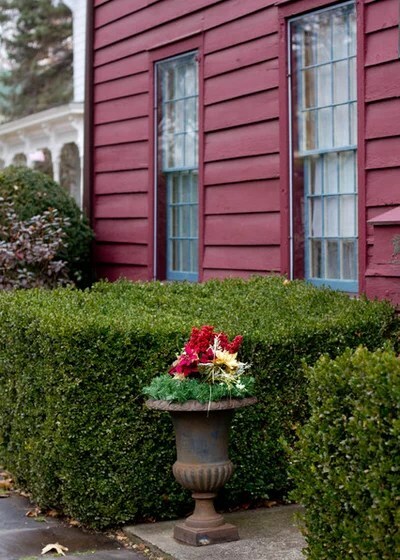 A winter container arrangement helps light up the dormant season. 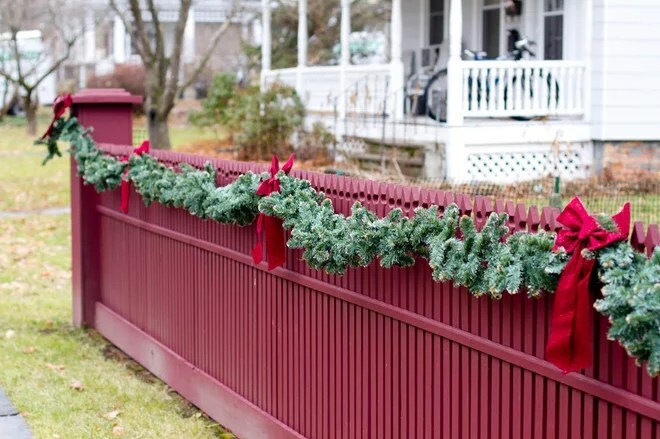 When the trees go bare, this fence goes green. One of the best parts about celebrating any holiday is gathering with friends and family around the table for dinner. Holidays meals are special because they are often one of the few times everyone is home and together again. 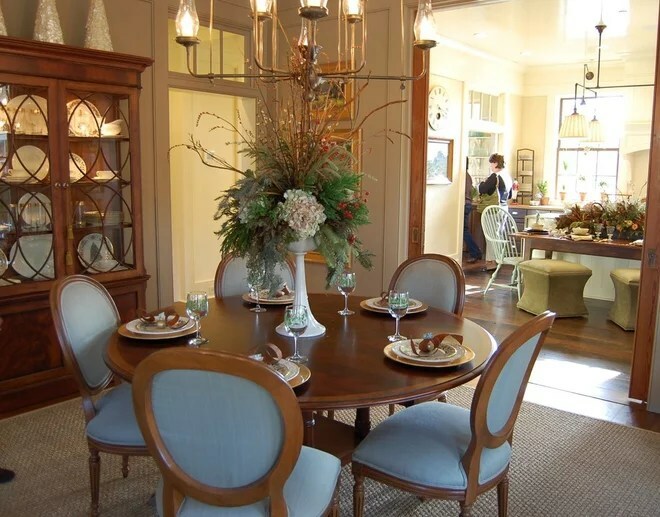 Make those events feel even more special by setting a beautiful table. Here’s some wonderful inspiration to help you plan your holiday dinners. Before you even get close to this table, the sweet scent of narcissus will draw you in. The silver and white speak of elegance, and you can’t wait to get closer for a better look. 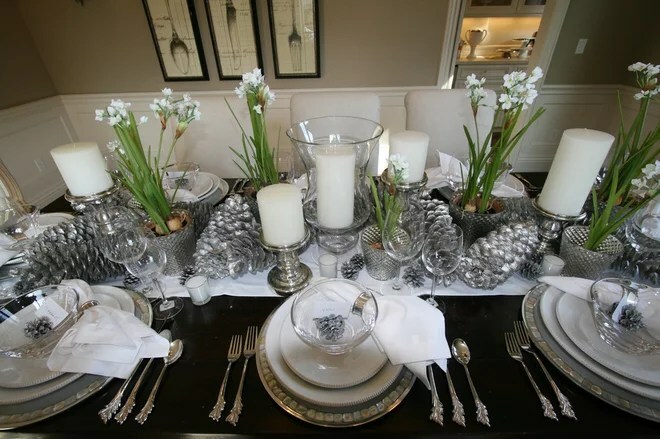 White narcissus are beautiful in a holiday centerpiece. Besides their heavenly scent, they remind us to hang tight through the cold winter because the promise of spring is just around the corner. 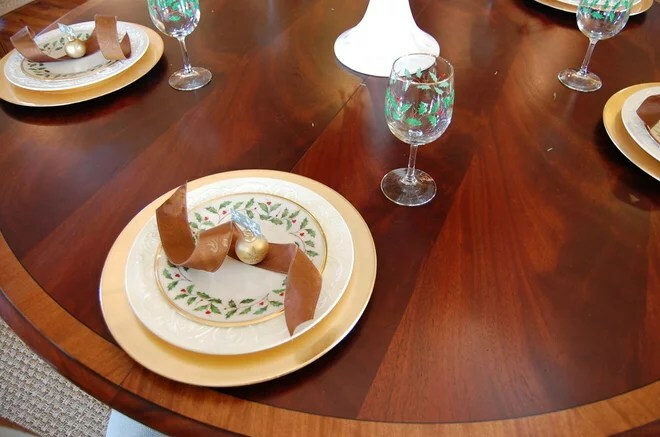 This is the perfect tablescape if your budget is feeling a bit stretched. You can usually find very affordable, 4 inch pots of narcissus in most garden or big box hardware stores. Shop the discount stores for white candles and spray paint a few pine cones silver, and your centerpiece is complete. 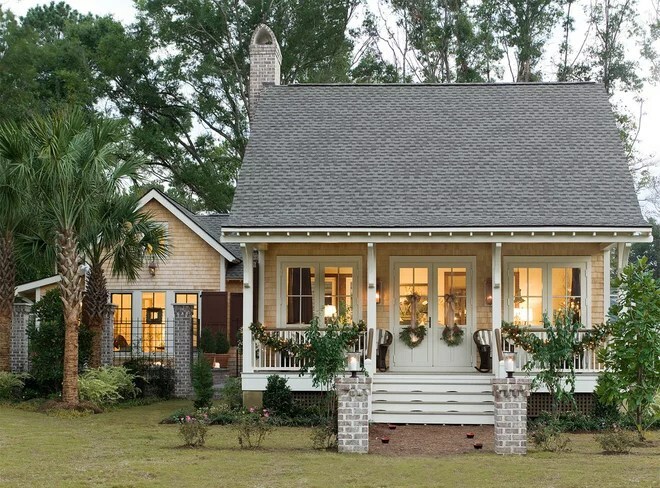 Recently I had the opportunity to tour this year’s Southern Living Idea House in Senoia, Georgia. 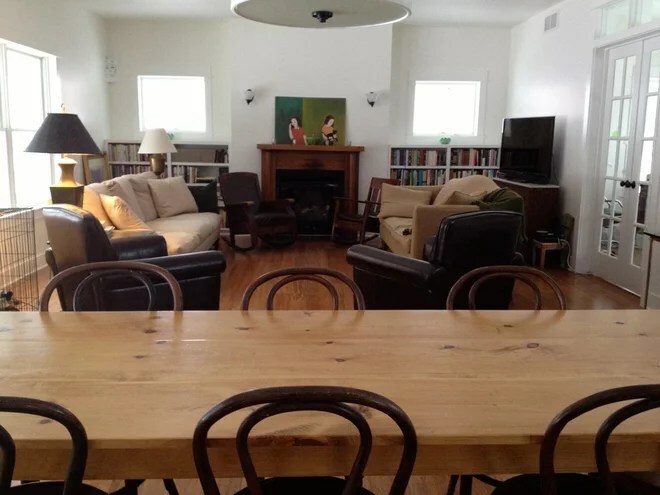 This is a view of the dining room. 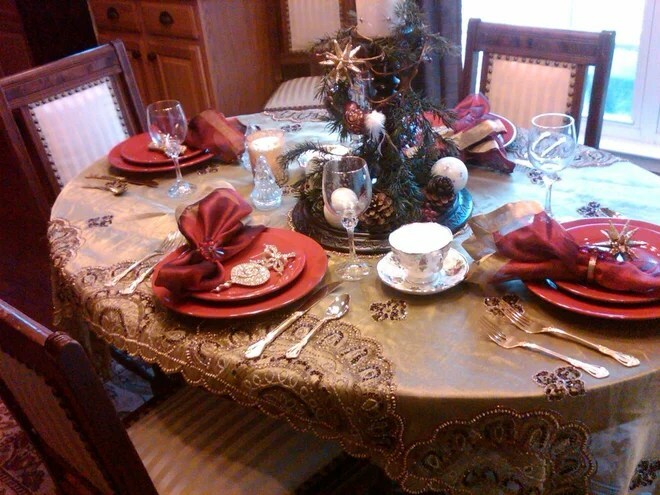 The dining table was dressed for a holiday dinner. 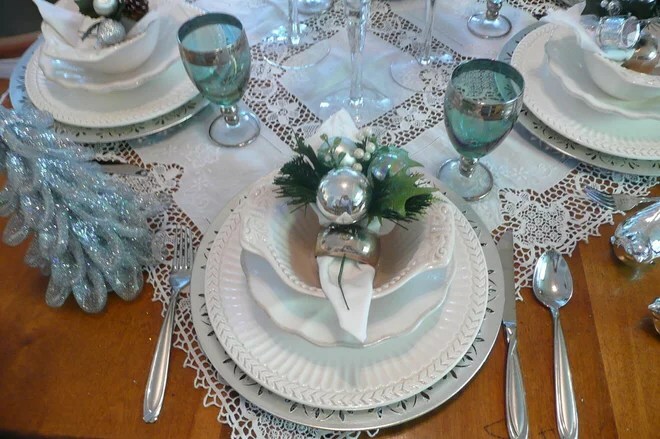 Though this place setting was incomplete, lacking flatware and a napkin, I loved the simplicity of the curled ribbon with a little ornament placed atop the salad plate. 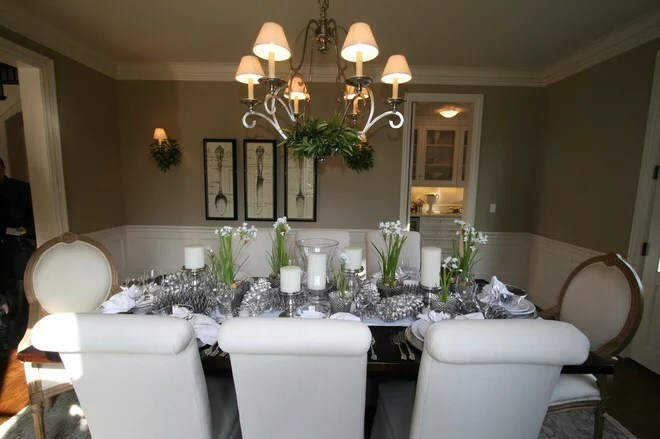 The kitchen table also showcased a lovely holiday tablescape in muted colors of green, brown and cream. All the centerpieces and mantels were dressed with fresh greenery. This centerpiece even contained clove-studded oranges. 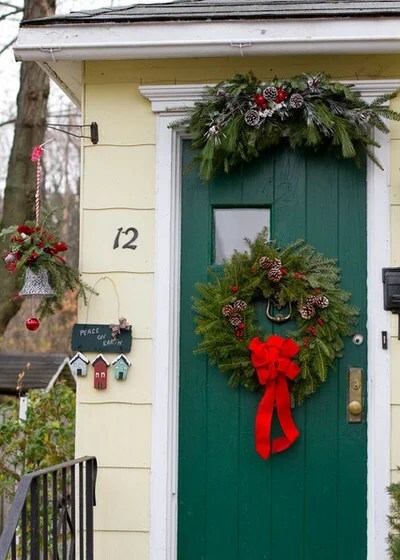 At Christmastime you can never go wrong with the traditional colors of green and red. Every holiday table needs a special centerpiece. Don’t have anything blooming in the yard at this time of year? No problem! A few pretty wrapped presents will set the mood for your holiday table. 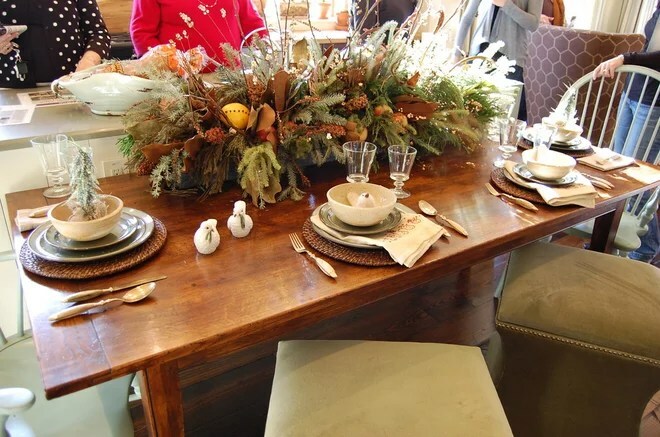 If red and green isn’t what you had in mind, consider a frosty winter table setting. 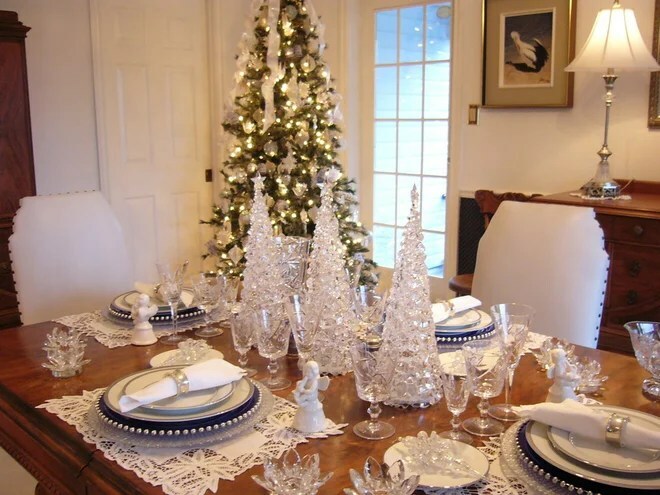 Pull out your white china and combine it with silver chargers, lacy or open cutwork place mats and your best stemware for a table they’ll be talking about until next Christmas. Soft blues and aquas are really popular right now, and combined with white, it really creates a beautiful table setting. 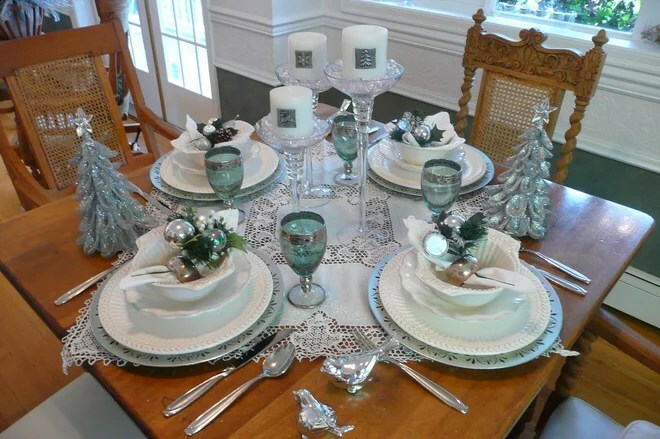 I especially like how the soft blues are evident in the centerpiece, trees and even the napkin rings. Tip: If your table is cozy and space is at a premium, place your napkin across the center of your bowl or salad plate. 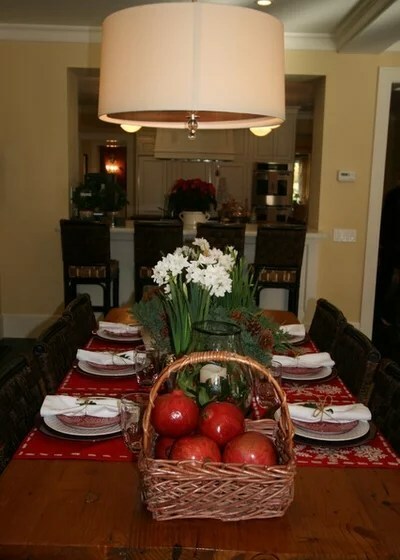 Narcissus also work great combined with the color red for a holiday table setting. Add a little candlelight, some luscious, red pomegranates in a wicker basket, and you’re all set for your holiday dinner. Tip: Don’t worry if you don’t have a fancy tablecloth. Mix and match your holiday colored place mats for a look that’s cozy and casual. 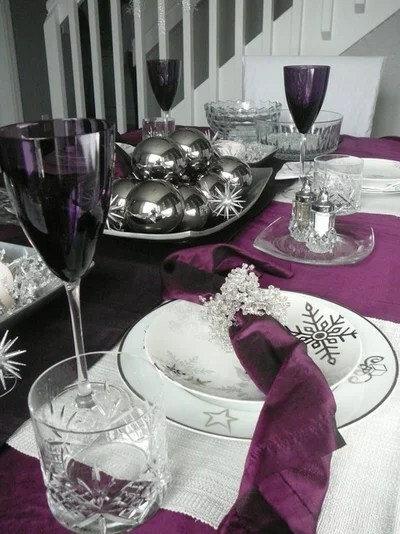 Silver combined with almost any color feels festive and just right for a holiday table setting. Here’s another great idea for a simple, inexpensive centerpiece. Silver ornaments grouped on a silver tray feel elegant and sophisticated. 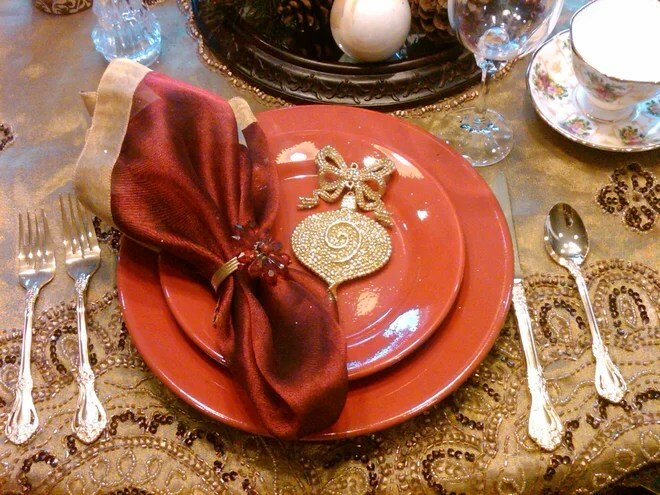 The colors gold and red combined with a natural or woodsy centerpiece are perfect for a Christmas table setting. If you’d like to give your guests a little gift with which to remember the evening, consider a pretty ornament for each place setting. This beaded ornament perfectly highlights the gorgeous beaded tablecloth. 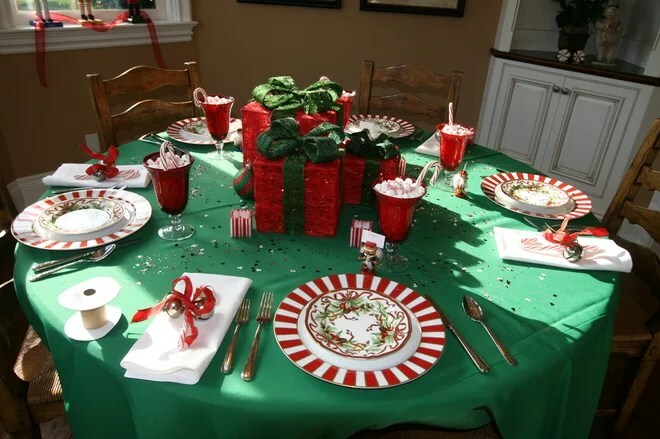 Do you have a favorite color combination for holiday dinners? Or an idea for an easy, budget-friendly centerpiece? 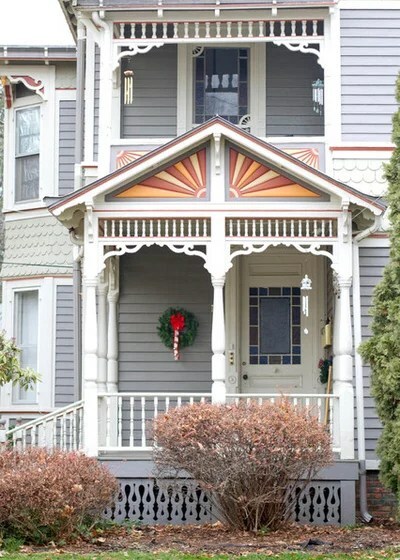 Now that you’ve gotten your feet completely immersed in 2016 and had time to recuperate from the holidays, you might be eager to tackle your New Year’s design resolutions for your home. Whatever those may be, you can start by looking back at trends from the last few years and see which ones are holding up well. As a designer, I’m always trying new things, but I also like to check in with my past clients to find out what’s still working for them. Here are some recent trends I’ve used in clients’ homes that are still making them smile and should continue to for years to come. This is a trend that may pass eventually, but probably not anytime soon. 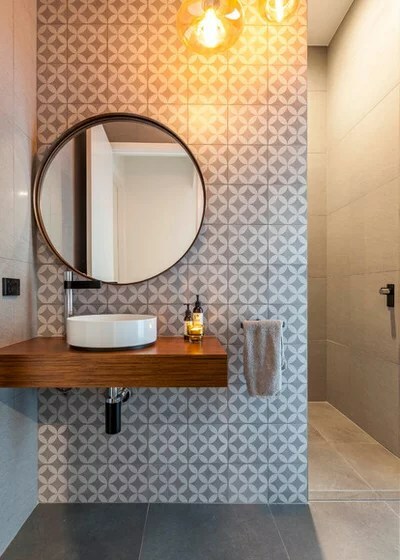 Graphic tiles make a big statement and hearken back to the midcentury, when tiles embraced color and pattern. 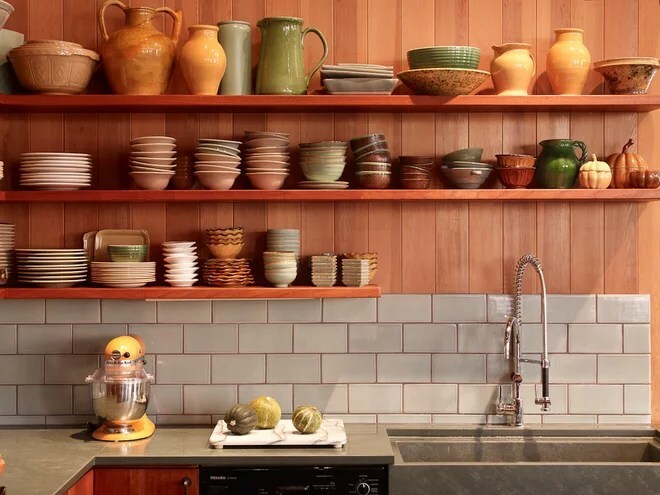 Try to find something you feel you can live with for a long time, as tiles are quite durable. Think of it as art. 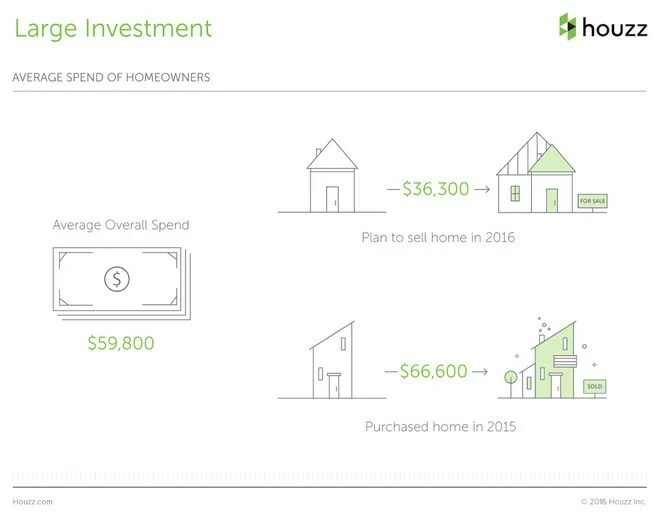 It’s an investment that will grace your walls for years to come. This trend is here to stay. Today, people are designing their spaces to be used. 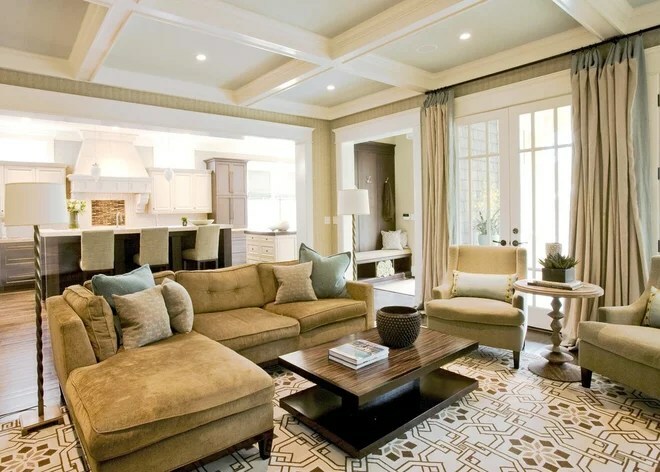 The formal living room is mostly a thing of the past in many homes, and creating spaces where you can hang out with friends and family in a comfortable manner as opposed to a formal one seems to be the way to go. I really hope this trend sticks around forever. I love that designers are finding ways to minimize waste and turn old, worn materials into things of beauty. What better way to bring attention to one of the most important things in your house than with a dark, bold frame? The natural light coming into your house is essential. 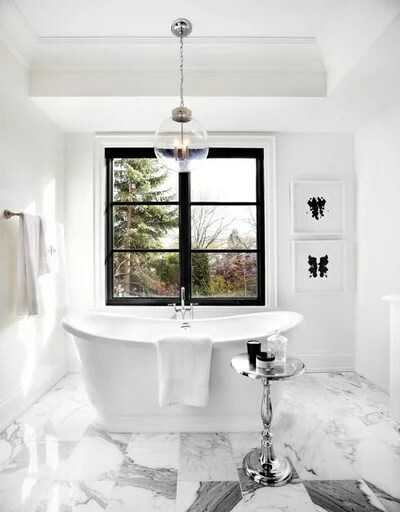 If there’s a view that goes along with that natural light, accentuate it with a bold black window frame. I view light fixtures as art. It’s one of those items I encourage my clients to splurge on. 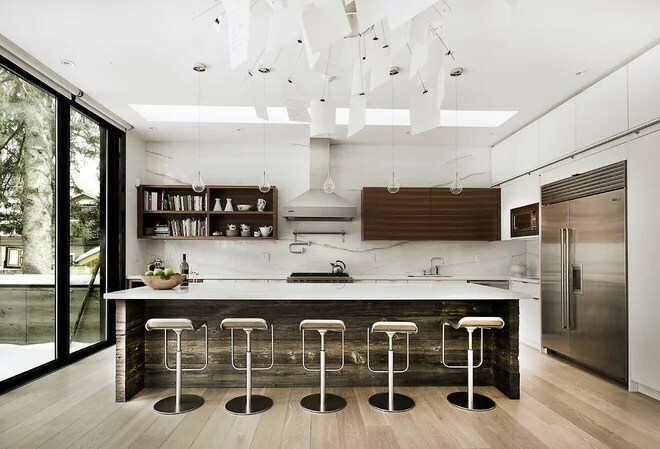 You can have the most simple space, but if you put an amazing light fixture in it, you automatically boost the room’s atmosphere and presence. 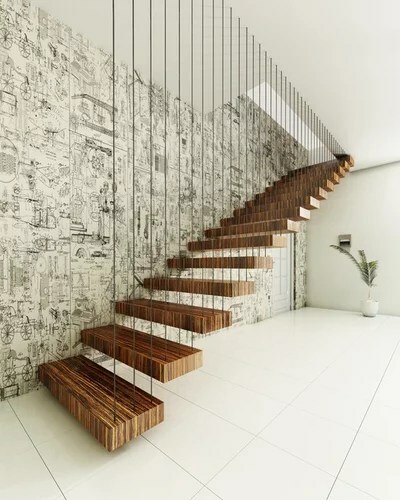 Stairs take you up or down from one floor to another. 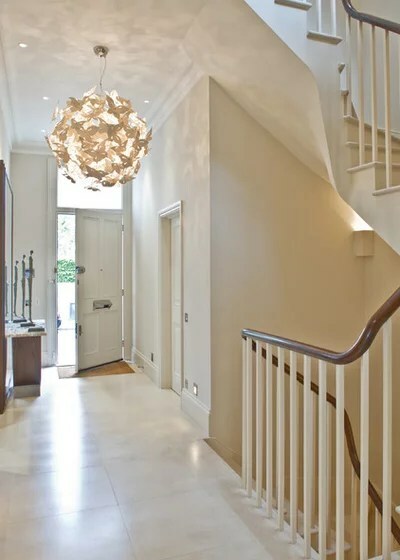 But when stairs are transformed into a design focal point, beyond merely a mode of transportation, then you lift your renovation to the next level. This has to be the No. 1 request I get these days. Every one of my clients asks for their spaces to be opened up. 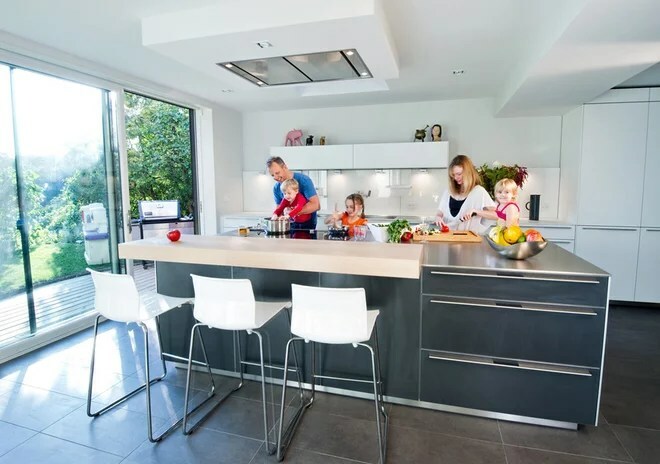 Today’s families tend to be incredibly busy, and multitasking is the norm. Having clear views of what’s going on in your home from anywhere in the house makes sense. 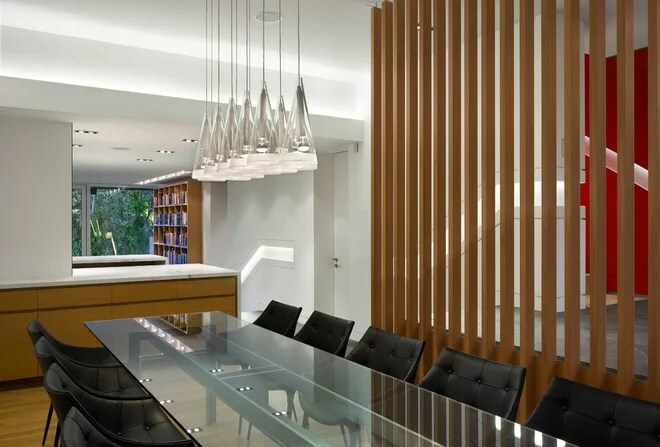 Just as the formal living room is a thing of the past for many, the formal dining room is also going the way of the dinosaurs. People are starting to realize that pleasures are not experiences that should occur occasionally, but rather should be part of everyday life. 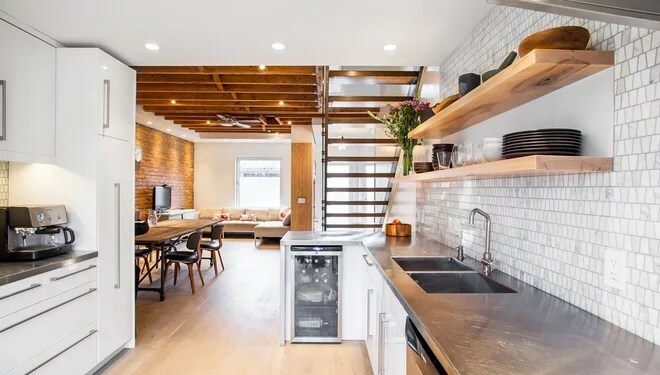 We could have a debate about minimal design for years to come, but at the end of the day, this is a trend that makes sense for healthy living. Creating a space that’s free of clutter and ornate decor means a space that’s easier to focus in, easier to clean and easier to move through.